The ‘Utility-Agnostic’ Home Energy Platform? MyEnergy claims it has the “richest” energy platform. How will it stack up with similar companies already working with utilities? 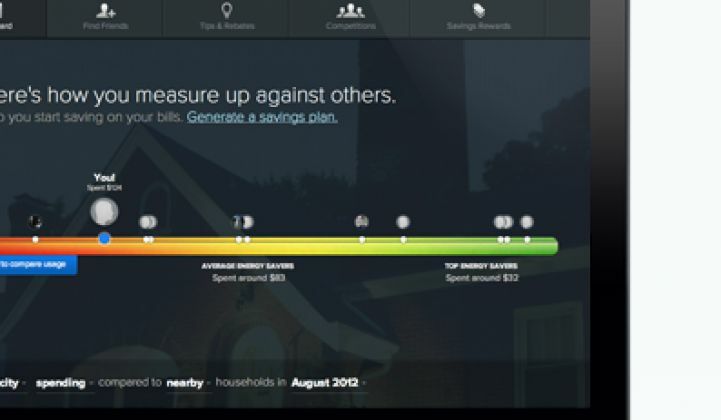 MyEnergy, a startup that’s built what it describes as a utility-agnostic way to collect, analyze and present energy data to homeowners, has a new utility client to test it out. The Boston-based startup announced this week that Minnesota Valley Electric Cooperative, a 35,000-customer utility with smart meters and demand response plans, has picked it for its new customer demand response and engagement program. It’s the first publicly disclosed utility partnership for the startup, founded in 2007 under the name EarthAid and funded with an undisclosed amount from local early-stage VC firm Point Judith Capital. But at the same time, MyEnergy has been growing a small, but widely scattered, set of users, with people using it at over 1,500 utilities and service territories, company co-founder and CEO Ben Bixby told me in an interview this week. Indeed, Bixby has been saying for years now that the startup can work outside the utility, serving up real bill data directly to customers, as fast as utilities themselves can get the data -- a pretty striking claim that Bixby says is backed up by some core intellectual property. Think of it as an outsourced re-creation of a utility’s customer billing and verification platforms, only pulling data from every utility in the country, and you get a sense of the scope. Bixby told me this week that MyEnergy can retrieve and collect data on water, gas, electric and other utility bills, pulling both public and proprietary sources of data, “as frequently as the utility is reading their meter.” Mostly, of course, that’s old-fashioned monthly bills, which MyEnergy accesses and filters for customers, adding features like explanations of all those service charges most customers never bother to read. For utilities that have smart meters, MyEnergy can turn around data to customers at the speed it comes back from the meters to the head-end system -- hourly, in MVEC’s case, he said. MyEnergy can push that data to customers via email or text message, as well as update them on their web page interface -- features that some utilities with smart meters are rolling out, though not necessarily with the freshest data (most require a day or so to process it). MVEC wants to sign up a lot of customers for a new demand response program to shed summer peak loads, Allan Telio, MyEnergy's vice president of business development, said. MyEnergy’s platform helps do that via features like smart meter energy updates, neighbor-to-neighbor comparisons, monthly bill forecasts, efficiency tips, and energy-saving contests between schools and corporate teams, he said. MyEnergy isn’t alone in using these techniques -- they’re also part of the portfolio of home energy companies such as Opower, which connects with customers via everything from mailed reports to OpenADR-based pilot programs with partner Honeywell, and Efficiency 2.0, the contest-based home energy customer portal and platform startup bought by C3 last year. But MyEnergy appears to differentiate itself by offering all that specific, individual energy data without a utility linkup. That same feature, by the way, allows the startup to deploy without extensive integration with a utility’s existing back-end customer information service (CIS) or billing management platforms, Telio said. Instead, MyEnergy’s platform does much of the heavy lifting, in terms of customer management and billing data aggregation and processing, that might otherwise put a program like this out of the reach of many municipal and cooperative utilities’ IT budgets, he said. The startup is also working with several other electric cooperatives, Telio said, and is also engaged with what he described as one of the biggest natural gas utilities in the United States, with about 2 million customers -- though he wouldn’t provide any further details. MyEnergy will no doubt have to contend with a whole lot of competitors in the still-nascent home energy space in order to be heard. Since the company was founded in 2007, we’ve seen Google and Microsoft enter and then leave the home energy IT space, a bubble of VC investment that has since deflated. Key startups that have been at it since that time, such as Tendril Networks, have struggled amidst a market that still remains limited mostly to utility pilot projects. Still, some utilities are rolling out smart-meter-enabled demand response to customers en masse (Oklahoma Gas & Electric, Canada’s Ontario Province), and we can expect more to join in as these programs prove their value. Most of these have been bigger, investor-owned utilities, though Ontario has a lot of smaller munis participating via a unique IT infrastructure set up to manage the province-wide time-of-use pricing instituted two years ago. MyEnergy is also not the first company to target those muni and co-op utilities with smart grid and home energy management. Options for that market include smart grid service offerings from giants like General Electric and integration experts like SAIC, as well as pre-integrated demand response platforms, like the one offered by Aclara and Calico Energy. So far, none of these have announced more than a handful of customers, however -- perhaps a sign of the tough economic times for U.S. cities and rural regions. As for MyEnergy’s “special recipe” approach to managing big data to yield efficiency insights, similar claims are shared by companies like Agilis, which works with real estate firms and energy services companies; FirstFuel, which uses utility meter data to build energy profiles of buildings and portfolios of buildings; and Retroficiency, which is another startup funded by Point Judith Capital with a data integration approach that can bypass the utility in analyzing building energy efficiency measures.